Today I am going to share three fun beauty recipes with you all that smell and look good enough to eat! Learn to make a strawberry lip scrub, chocolate face mask and face scrub, as well as a lovely rose and lavender body scrub! I love creating my own beauty products because it is a great way to save money and to avoid harsh chemicals, parabens, and preservatives. All three of these DIY beauty recipes are extremely easy to make, will help rejuvenate your skin and will leave you smelling incredible all day long! Watch the Video Tutorial to see how to make these Fun Beauty Recipes! This body scrub will leave your skin feeling silky smooth and moisturized! Cocoa powder is filled with antioxidants so not only is it gray for your body in moderation of course but your skin will love it as well! This strawberry lip scrub will leave you with a kissable pout! *Step by step instructions are available in the video above! 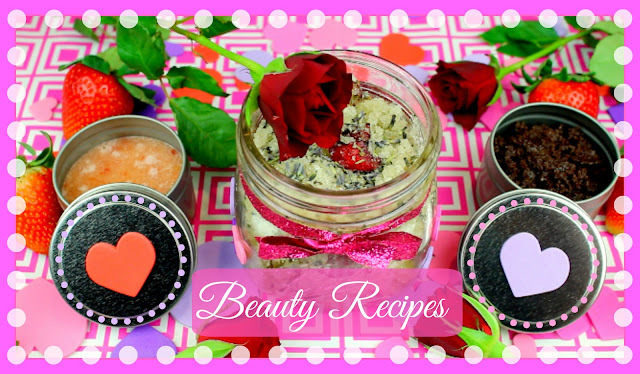 I had a lot of fun creating these beauty potions and I can’t wait for you all to try these beauty recipes out yourself because not only are they fun to create but they really do work. Let me know which beauty recipe is your favorite. If you try any of them out make sure to snap a picture of your creations and share them with me on FaceBook, Instagram, or Twitter!